Bringing a new puppy into your home is always a learning experience. Even if you have owned a dog before, you may notice things about your puppy that you've never seen before. One thing that often catches new owners off guard is their puppy's appetite. Many young dogs will scarf down any bit of food you place in their bowl. Not only with they eat it all, but they'll eat it fast. This can be an alarming thing to watch. You may start to worry that you're not feeding your pooch enough food. Some owners will give in to those puppy dog eyes and provide more and more food until the puppy can't eat anymore. It's important that you avoid this. It can lead to weight gain and significant health issues in the future. 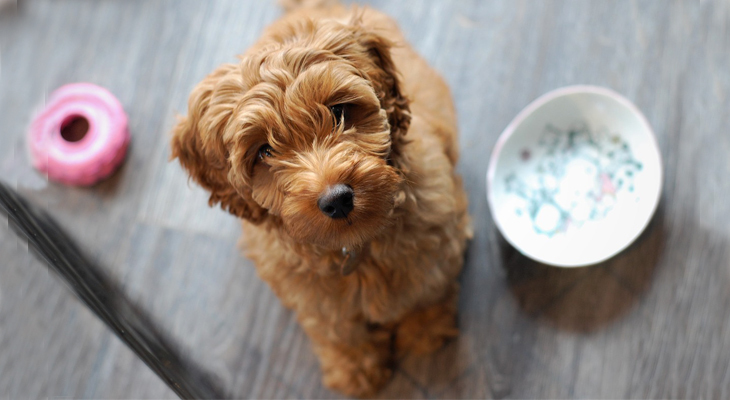 So, why exactly is your puppy so hungry all the time? The answer may surprise you. One of the biggest reasons why it may seem like your dog's stomach can never be filled is the new feeding schedule. When you take your puppy home, you're taking them away from everything they know. They're learning how to function in this new world they're in. Training is essential during your puppy's first few months home. While we don't typically think of feeding as a training technique your dog needs to know, it's a pretty big deal to them. When puppies are first born, they pretty much have an endless supply of food at their disposal. Their mother is always nearby ready to give them milk. Newborns constantly feed off their mother. Once they're weaned off their mother's milk, they have to adapt to this brand-new schedule you've set for them. They're going from a constant supply of food to waiting eagerly for you to provide them with their next meal. It's a big change that they have to process. This is why it's so important to stick to a meal schedule. Over time, your new canine companion will learn the ropes. You may find that they start to slow down their excitement a bit as they get older. Another reason why your pup can't get enough kibble is their instincts. In the wild, dogs have a feast-or-famine mentality. When they have access to fresh food, they'll eat as much of it as possible. They do this because they don't know when they'll have a chance to get some more food. It's why many dogs and wild canines are so territorial around their meals. They don't want to share it because they need it to survive. While your puppy hasn't had to experience that kind of lifestyle, it's in their blood. Your new puppy gets excited for each meal because they don't know when they're going to get more. You need to stick to your training to make sure that this behavior is stopped. Often times, fast and ravenous eating is accompanied by other behaviors wild canines do between meals. Most wild dogs will scavenge for food and hide any leftovers they have for later. Does this seem familiar? You may notice your dog trying to get into the trash can or stash bones away. It all has to do with their canine instincts of survival. They may also be going through a survival mode due to their upbringing. If you adopted a slightly older puppy at a shelter, they may not have received adequate amounts of food during their stay. The same can be said for puppies that spent any amount of time as a stray. They still think that they need to eat a lot to stay alive. If this behavior is caused by a past experience, it can be a bit more challenging to stop. Be watchful and stick to your feeding schedule. Eventually, your puppy will start to feel safe. 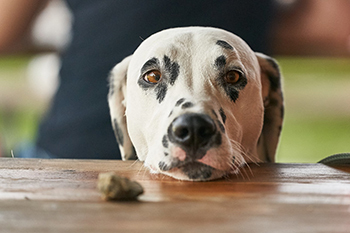 If you've ever given in to your pup's longing stares as you eat, you may be partly to blame. Dogs learn as much about us as we do about them during the puppy stage. If your dog realizes that they can get more food by simply begging, they'll do it. You should never give in to your pup's pleas. Always stick to your feeding schedule. When it's time for you to eat your lunch or dinner, try sticking your puppy in another room. This will automatically remove the temptation to beg. Over time, they may learn that begging gets them nowhere. Sometimes, your puppy's indulgent nature is a symptom of an underlying health issue. There are a number of conditions that affect appetite. It's a good idea to take your puppy to a vet to rule any of the following issues out. Worms are fairly common among puppies. Many new dogs are born with them due to an infection in the womb. There are many different types of worms that can affect your dog. All of them feed off of your dog's body. They cling onto the intestinal walls and absorb all the nutrients from the food you're providing them. This leads to malnutrition and an increased appetite. Take your pup to the vet for a stool test. The test will determine if worms are to blame. Luckily, worms are relatively easy to treat and don't produce any lasting effects. Also known as Hyperadrenocorticism, Cushing's disease can cause an increased appetite in dogs. If your dog has this disease, their body is producing too much glucocorticoid. This is a hormone that helps to manage stress. Too much of it can cause your dog to want more food all the time. Consult with your vet for an effective treatment and management plan. Diabetes is something that can affect dogs at any age. When dogs are affected by diabetes, they have a surplus of glucose in their blood. The glucose can't make its way into the cells due to a lack of insulin. As a response, your dog's cells will think that they're not getting enough nutrients. Your dog will have an insatiable appetite that can't be remedied. Diabetes is a very serious condition that requires ongoing care. While it can't be cured, you can manage it with the proper treatment methods. If your dog's body isn't absorbing the nutrient in his or her food properly, they will automatically feel hungrier. These nutrients are vital for growth and development. Without them, your dog is at risk for many health issues. There are a number of reasons why nutrients aren't being absorbed. It could be caused by a bacterial infection, a lack of digestive enzymes, and much more. The best thing you can do is stay on top of your feeding schedule. Try your best not to deviate too much. Eventually, your dog will learn when it's time to eat and when it's not. This can do wonders in your behavioral training efforts. If you want to speed up the process, there are a couple of other things you can do as well. When you first bring your puppy home, start by splitting up their diet into four separate meals. You can feed four small meals throughout the day to make the transition from free feeding a little smoother. A few months later, move to three meals each day. By the time your puppy reaches full adulthood, you should bring the meal frequency down to two a day. Adding some water to your pup's meal can slow them down and prevent them from eating everything in a few seconds. It's often recommended that you moisten food when your puppy is only a few weeks old. Mashing up the food with a fork makes it easier to consume. As they get older, decrease the water until you're providing them with nothing but dry kibble. Something as simple as a cup in the middle of the bowl can do a lot to slow your puppy down. Adding a large object to their food dish will force them to eat around it. There are also many specially-designed food dishes that have strange patterns and pockets for food to fall into. These products are designed to prevent bloating. They can also be used with excited puppies. Hungry puppies will eventually learn to control their eating habits. Be patient and keep a watchful eye on your dog. If the issues don't stop as they get older, consult with your veterinarian. Also Read: Raw Diet for Puppies: How much to Feed?